Welcome to the new frontier of Arduino-compatible boards, made possible by the ATmega32U4. No longer does your Arduino need to be harnessed by an FTDI Cable, or an ATmega8U2, or any chip who's sole purpose is acting as an intermediary between your Arduino and your computer. 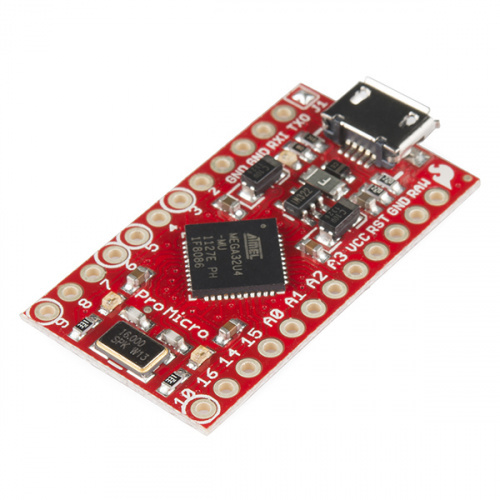 The SparkFun Pro Micro [ 3.3V/8MHz and 5V/16MHz ] is a really cool, little development board. It's an Arduino-compatible microcontroller, micro-sized, and it accomplishes with one single chip what old Arduino Unos, Duemilanoves, and Diecimeillas could never dream of: true USB functionality. This tutorial also covers the Fio v3, which works a lot like the Pro Micro but adds features like easy XBee interfacing and LiPo charging. Hardware Overview: Pro Micro -- An overview of the pinout and hardware features of the Pro Micro. Hardware Overview: Fio v3 -- An overview of the pinout and hardware features of the Fio v3. Installing on Windows -- How to install the drivers and Arduino addon on Windows. 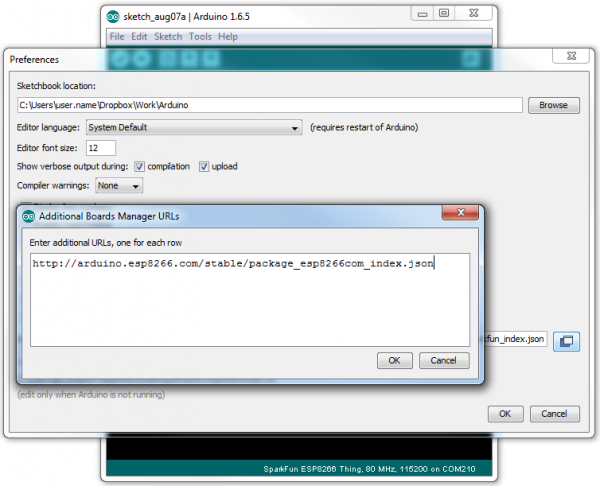 Installing on Mac/Linux -- How to install the drivers and Arduino addon on Mac. Example 1: Blinkies -- A simple "Hello, world" sketch specifically suited to the Pro Micro and Fio v3. 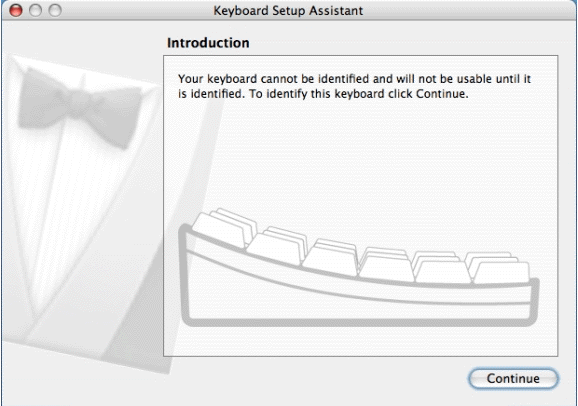 Example 2: HID Mouse and Keyboard -- An introduction to the HID USB capability of the Pro Micro. How to emulate USB keyboards and mice! Troubleshooting and FAQ -- Helpful troubleshooting tips and tricks for getting the most out of the Pro Micro. Before delving into this tutorial, here are some concepts you should be familiar with. If you're not, consider checking out the related tutorial first. What is Arduino? -- An introduction to the Arduino platform and IDE. How to Install Arduino -- A general installation guide for Arduino. Serial Communication -- Serial is a great, easy-to-use communication protocol. 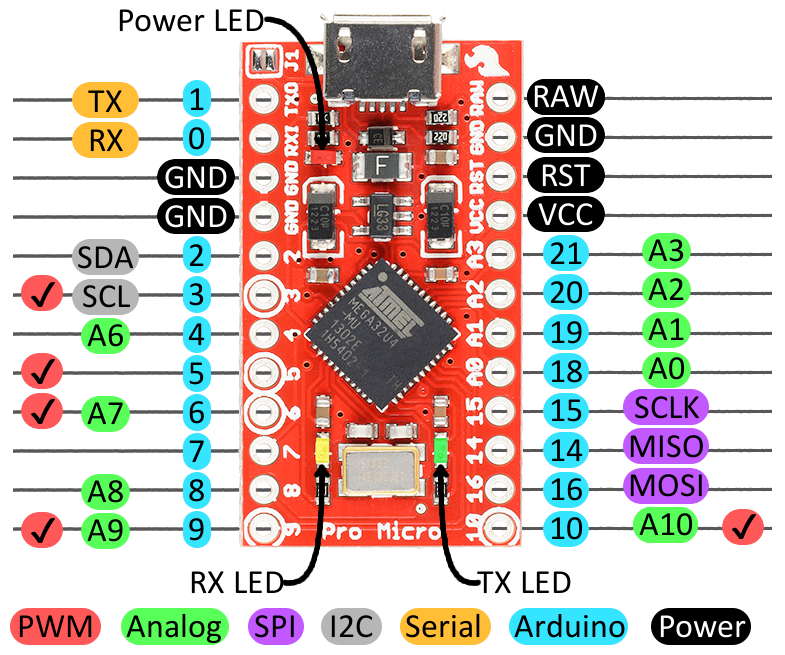 Before we get into installing and using the Pro Micro, let's quickly look at the board -- examine its inputs, outputs, and other hardware quirks. RAW is the unregulated voltage input for the Pro Micro. If the board is powered via USB, the voltage at this pin will be about 4.8V (USB's 5V minus a schottkey diode drop). On the other hand, if the board is powered externally, through this pin, the applied voltage can be up to 12V. VCC is the voltage supplied to the on-board ATmega32U4. This voltage will depend on whether you're using a 3.3V/8MHz Pro Micro or a 5V/16MHz version, it'll be either 3.3V or 5V respectively. This voltage is regulated by the voltage applied to the RAW pin. If the board is powered through the 'RAW' pin (or USB), this pin can be used as an output to supply other devices. RST can be used to restart the Pro Micro. This pin is pulled high by a 10k&Ohm; resistor on the board, and is active-low, so it must be connected to ground to initiate a reset. The Pro Micro will remain "off" until the reset line is pulled back to high. GND, of course, is the common, ground voltage (0V reference) for the system. The Pro Micro's I/O pins -- 18 in all -- are multi-talented. Every pin can be used as a digital input or output, for blinking LEDs or reading button presses. These pins are referenced in the Arduino IDE via an integer value between 0 and 21. (The A0-A3 pins can be referenced digitally using either their analog or digital pin number). Nine pins feature analog to digital converters (ADCs) and can be used as analog inputs. These are useful for reading potentiometers or other analog devices using the analogRead([pin]) function. There are five pins with pulse width modulation (PWM) functionality, which allows for a form of analog output using the analogWrite([pin], [value]) function. These pins are indicated on-board with a faint, white circle around them. 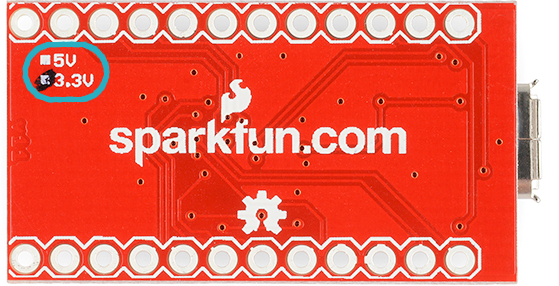 There are hardware UART (serial), I2C, and SPI pins available as well. These can be used to interface with digital devices like serial LCDs, XBees, IMUs, and other serial sensors. The Pro Micro has five external interrupts, which allow you to instantly trigger a function when a pin goes either high or low (or both). If you attach an interrupt to an interrupt-enabled pin, you'll need to know the specific interrupt that pin triggers: pin 3 maps to interrupt 0 (INT0), pin 2 is interrupt 1 (INT1), pin 0 is interrupt 2 (INT2), pin 1 is interrupt 3 (INT3), and pin 7 is interrupt 4 (INT6). There are three LEDs on the Pro Micro. One red LED indicates whether power is present. The other two LEDs help indicate when data is transferring over USB. A yellow LED represents USB data coming into (RX) the the Pro Micro, and a green LED indicates USB data going out (TX). 3.3V or 5V? 8MHz or 16MHz? Pro Micros come in two flavors, which vary by system voltage and operating frequency. The standard 5V Pro Micro runs at 16MHz, and is very comparable to an Arduino Leonardo, while the 3.3V version of the Pro Micro runs at half the speed (to remain in the safe operating zone at the lower voltage) -- 8MHz. The operating voltage of your Pro Micro determines the maximum allowable voltage on any of the I/O pins. For example, if you have a 3.3V Pro Micro, don't interface it with something that outputs 5V. Don't forget which version you have! We'll need to differentiate between the two when we get to uploading code in Arduino. If you're not sure which version you have, check the back corner of the board. One of two boxes should be checked to indicate the operating voltage. As the Pro Micro's main feature is its innate USB functionality, the most common way to power it is via USB. In this setup, a 5V Pro Micro will be powered directly from the USB bus and a 3.3V Pro Micro will regulate the 5V supply coming in from USB down. The other end of the USB cable can be connected to either a computer, USB hub, or a USB wall adapter, which can (in most cases) provide more power. Alternatively, if your Pro Micro is living out in the wild, out of reach of USB cables, it can be powered through either the 'RAW' or 'VCC' pins. A supply going into the 'RAW' pin will be regulated down to the correct operating voltage (5V or 3.3V). To be safe, it shouldn't be any higher than 12V, and it should be at least 1V more than the Pro Micro's operating voltage (e.g. >6V for a 5V Pro Micro). Pro Micro powered through the RAW pin by a set of four, series AA batteries. If you power the Pro Micro through the 'VCC' pin, keep in mind that this signal is unregulated. Only use this if you have a clean, regulated 3.3V or 5V supply to connect to it. How, exactly, you power your project is up to you and the demands of your project. If you're making something battery powered, you may want to opt for the 3.3V Pro Micro, which could be powered by a LiPo battery or a couple alkalines. On this page we'll examine the hardware half of the Fio v3, looking at the pinout, layout, and schematic of the board. The Fio v3 is like an elongated Pro Micro. On one end, it's shape and pinouts are similar to it's ATmega32U4 sibling. The other end of the Fio v3 is what makes it unique: a footprint for an XBee on the bottom, and a LiPo charging circuit on the top. Heads up! The pins labeled in the image are correct. However, the labels printed with the silkscreen on the physical board are incorrect. "D17" labeled on the board is Arduino pin 14/MISO. "D14" labeled on the board is Arduino pin 17/SS/ RXLED. The pins labeled '3.3V' break out the operating voltage source of the ATmega32U4. As long as the board is powered through the white JST connector or USB, this voltage is regulated down to 3.3V. These pins can be used as outputs to supply 3.3V to other devices. The 'RST' pin can be used to restart the Fio. This pin is pulled high by a 10kΩ resistor on the board, and is active-low, so it must be connected to ground to initiate a reset. The Fio will remain off until the reset line is pulled back to high. Many of the Fio's I/O pins are multi-talented. Every pin can be used as a digital input or output, for blinking LEDs or reading button presses. These pins are referenced in the Arduino IDE via an integer value between 0 and 23. (The A0-A10 pins can be referenced digitally via either their analog pin number or digital pin number). Eleven pins feature analog to digital converters (ADCs) and can be used as analog inputs. These are useful for reading potentiometers or other analog devices using the analogRead([pin]) function. There are six pins with pulse width modulation (PWM) functionality, which allows for a form of analog output using the analogWrite([pin], [value]) function. These pins are indicated on-board with a faint white circle around the pin. There are also hardware UART (serial), I2C, and SPI pins available. These can be used to interface with digital devices like serial LCDs, IMUs, and other serial sensors. The Fio v3 has five external interrupts, which allow you to instantly trigger a function when a pin goes either high or low (or both). If you attach an interrupt to an interrupt-enabled pin, you'll need to know the specific interrupt that pin triggers: pin 3 maps to interrupt 0 (INT0), pin 2 is interrupt 1 (INT1), pin 0 is interrupt 2 (INT2), pin 1 is interrupt 3 (INT3), and pin 7 is interrupt 4 (INT6). There are a variety of LEDs on the Fio, the simplest of which is the red power indicator. Two LEDs towards the bottom -- labeled RX and TX -- help indicate when data is transferring to and from the Fio through USB. A blue LED represents USB data coming into ('RX') the the Pro Micro, and a yellow LED indicates USB data going out ('TX'). There are three LEDs tied to the XBee interface in particular: stat, RSSI, and associate. 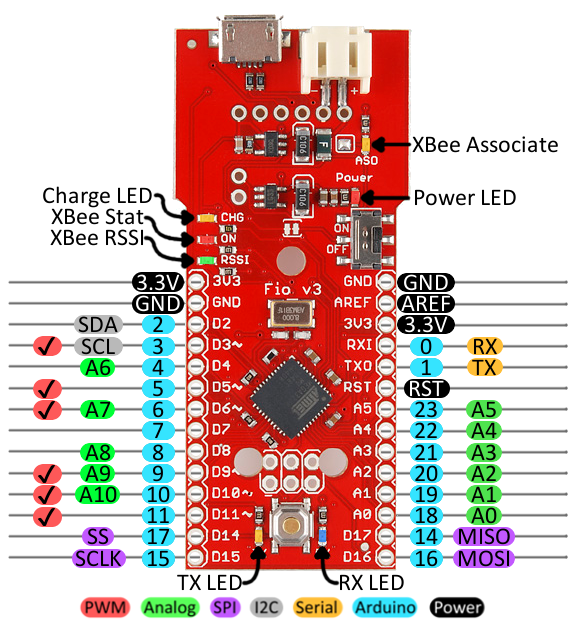 The red LED labeled 'ON' is connected to the XBee's pin 13 -- DIO9 -- which is, by default, set to indicate the XBee module's ON/OFF status. An 'RSSI' LED connects to XBee pin 6 (PWM0) which defaults to indicate RSSI (received signal strength) -- a brighter LED means a stronger received signal. Lastly, the 'ASO' LED connects to XBee pin 15, which will blink if the module is associated. Finally, there's a yellow LED labeled 'CHG' which indicates if an attached lithium polymer battery is charging. If a battery is not connected to the Fio, the LED will be in an undefined state, and most likely be illuminated. 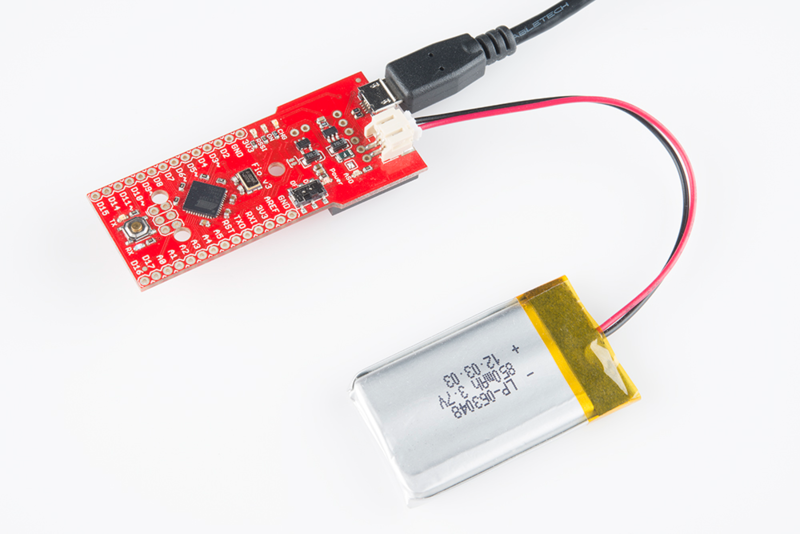 The suggested power supply for the Fio v3 is any single-cell lithium polymer (LiPo) battery. 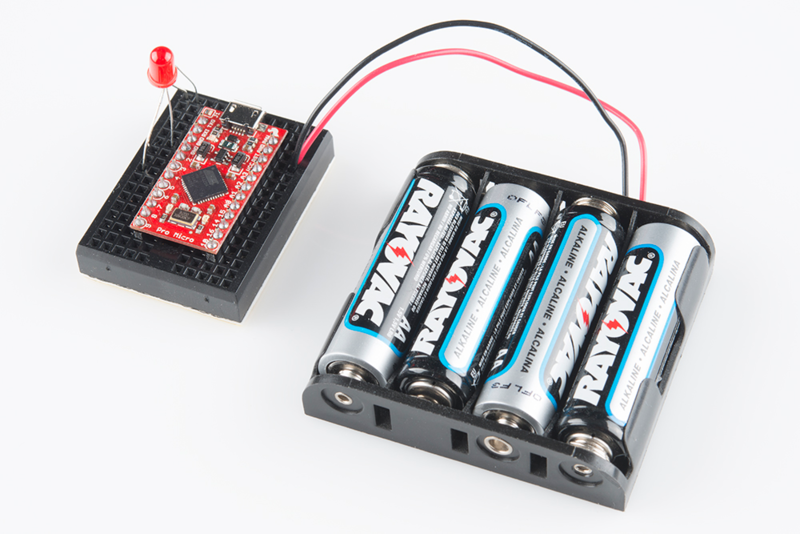 These batteries have a nominal voltage of 3.7V, which is perfect for supplying power to the 3.3V-operating Fio. LiPos are awesome, because they're rechargeable and still pack a lot of power into a tiny space. Any of our single cell LiPos with JST terminators can connect directly to the Fio's onboard JST connector. As an (immobile) alternative to batteries, the Fio can be powered directly through the USB connector. The Fio v3 has a LiPo charge management circuit (based around the MCP73831) built onto it, which handles the signal conditioning required to safely charge a single-cell LiPo battery. To use the charge circuit, you'll obviously need a single-cell LiPo battery plugged into the Fio. Then connect the board up via USB, so the charge circuit has a primary voltage source to supply charge to the battery. The 'CHG' LED will indicate the status of the battery charge. If it's on, the battery is still charging. Once the 'CHG' LED goes off, the battery is fully charged. The charge circuit is programmed to charge the battery at 500mA, so, to be safe, the battery should be no smaller than 500mAH in capacity. The XBee-footprint connectors on the bottom of the Fio v3 are what make it so unique. 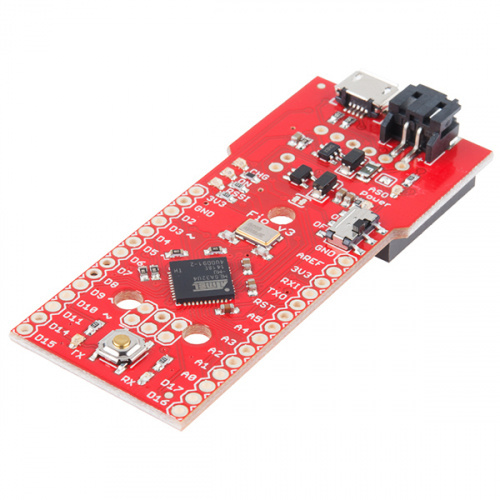 This product is designed to provide a simple interface between Arduino and XBee, as such a few of the XBee pins come wired up to the ATmega32U4. 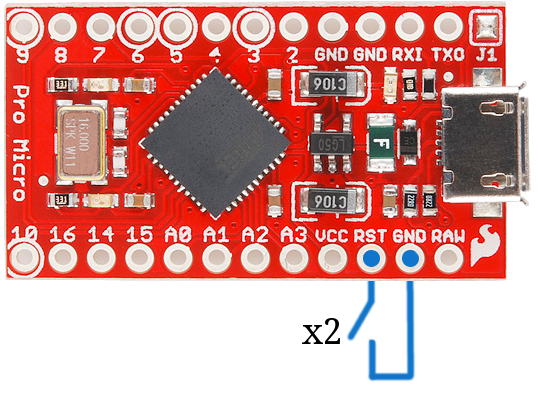 Most significantly, the serial interfaces of both devices are wired -- the XBee's 'DOUT' pin is connected to the ATmega32U4's 'RX', and 'DIN' is connected to 'TX'. XBee's are controlled and configured over a serial interface. 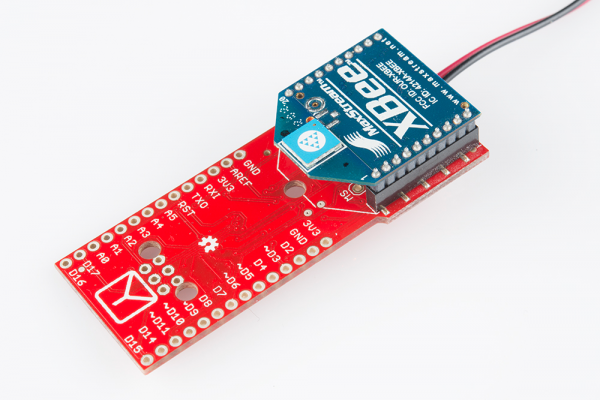 To learn more about using XBee's check out their datasheet and various tutorials for help getting started with these awesomely simple wireless transceivers. 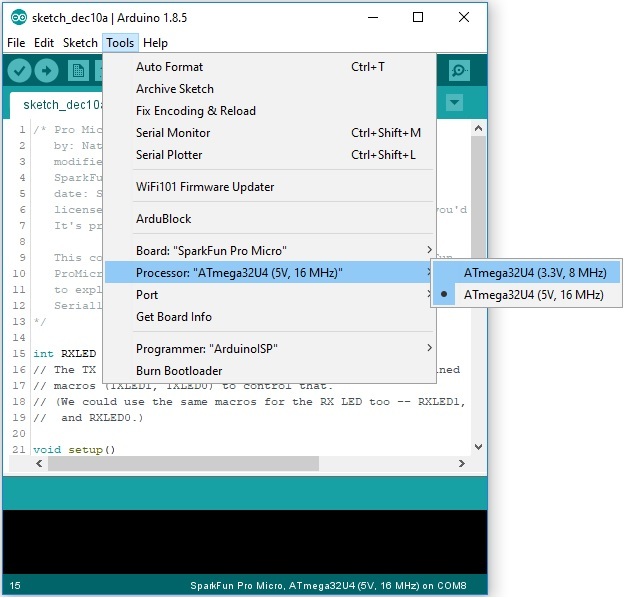 Getting the Pro Micro or Fio v3 set up on your computer and in your Arduino environment can be difficult. Follow along on this page for a step-by-step guide through the driver installation and Arduino-enabling process. Notice there are two options for the Pro Micro - 8MHz and 16MHz. It's very important that you select the Pro Micro option that matches your board's voltage and speed. This should be listed under the Tools> Processor. Don't know which board you have? Check the bottom of the board, where you should find either a '5V' or '3.3V' box checked. You should also see your Pro Micro's COM port under the 'Tools > Serial Port' menu. Select it, and head over to the Example 1 page where we'll upload our first piece of code. The Arduino-standard Blink sketch won't have any visible effect on the Pro Micro -- there's no LED on pin 13. In fact, the only LEDs on the board are the power indicator, and RX/TX blinkies. Unlike other Arduino boards, though, we can control the RX/TX LEDs in our sketch. So let's get blinking! Copy and paste the code below, and upload* it to your Pro Micro. license: Public Domain - please use this code however you'd like. It's provided as a learning tool. // macros (TXLED1, TXLED0) to control that. With the code uploaded you should see the RX and TX LEDs take turns blinking on and off every second. You can also open up the serial monitor (set to 9600 bps) and see every programmer's favorite two-word phrase. The RX LED is tied to Arduino's pin 17. You can control it just as you would any other digital pin. Set it as an OUTPUT, and digitalWrite([pin], [level]) it HIGH to turn the LED off or LOW to turn the LED on. The TX LED was not provided as an Arduino-defined pin, unfortunately, so you'll have to use a pair of macros to control it. TXLED1 turns the LED on, and TXLED0 turns the LED off. In that sketch, you'll also notice a pair of Serial initialization statements: Serial.begin(9600), Serial1.begin(9600). That '1' makes a huge difference. Think of the Pro Micro having two separate serial ports. The one without the '1' is for communication to and from the computer over USB; this is what is visible in the Serial Monitor. The Serial1 port is a bonafide, hardware UART, where your Pro Micro can talk to any serial-enabled piece of hardware. If you open up the Serial Monitor, you should only see 'Hello world' printed. 'Hello!' is being sent out over the hardware UART, where, presumably, nothing is listening. This begs the age-old question: "if a Pro Micro is saying 'Hello!' over the hardware serial port, and nothing is there to hear it, does the Pro Micro really say anything at all?." Why Does My Board Re-Enumerate Every Upload? In order to communicate serially, the Pro Micro emulates a virtual serial port. Actually, it emulates two different serial ports -- one for the bootloader, and one for the sketch. Since the bootloader and sketch run individually. Only one of these serial ports is visible at any one time. When you click 'Upload' in the Arduino IDE, the Pro Micro resets itself and starts its bootloader program. (The bootloader is a low-level program on the Pro Micro which enables self-programming via serial.) To our operating system, the bootloader looks like a completely different device, so it gets its own serial port number. While the Pro Micro is being programmed, the bootloader serial port will be open. When the sketch upload is finished, the bootloader will exit, that serial port will be closed, and the regular Pro Micro serial port will open up. What this all boils down to is the fact that you have to be patient with Pro Micros. Every time you upload a new sketch, your OS will need to work its driver magic before you can open up the COM port. This can take a few seconds after the code has finished uploading. * Note for Windows users: The first time you upload a sketch, it may fail and give you an error. On top of that Windows will pop up that familiar 'Device driver software was not successfully installed' notification. Don't let this worry you too much. If you get the error, wait about a minute, and try uploading again. Hopefully the upload will succeed the second time, but if it continues to fail, check out the how to enter the bootloader section of the FAQ. Windows needs to install the same driver we've already installed for the Pro Micro's bootloader, but it's unable to get everything set up before the bootloader exits. What are VIDs and PIDs? How Can I Change the VID and PID on an ATmega32U4? Why Does my ATmega32U4 Board Show up Twice in the Device Manager? How Does the IDE Know Which COM Port to Use? How Do I Reinstall the Bootloader? Unplug Pro Micro from your computer. Wait a few seconds for the device to be detached. Plug Pro Micro back in. Open Arduino back up, check the Serial Ports menu again. 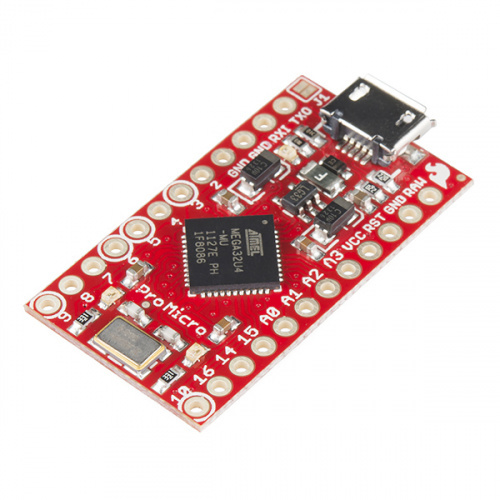 We ship the Pro Micro with a modified version of the Arduino Leonardo bootloader, with one major enhancement. When a Leonardo (or any device using the "stock" bootloader) is externally reset, it goes back into the bootloader...and waits there eight seconds before it starts running the sketch. For some embedded projects, waiting eight seconds before a program runs isn't acceptable, so we modified the bootloader run time. Leonardo bootloader on reset functionality. When a Pro Micro is externally reset (by pulling the RST pin low), it'll only briefly (<750ms) start the bootloader before continuing on to the sketch. If you need the bootloader to run longer, resetting twice quickly will get the Pro Micro to enter bootloader mode for eight seconds. Pro Micro and Fio v3 reset functionality. Press reset twice, quickly to enter bootloader mode. Resetting the Pro Micro's, in particular, can be tricky, because there's no reset button. The 'RST' pins needs to be connected to ground to initiate a reset. This can be done with a small piece of wire, or an externally connected button. Incorporating all of the USB tasks on a single chip is an awesome feature that makes the Pro Micro and boards like it truly unique. But it also places more stress on a single chip, and if anything goes wrong with that chip, the board becomes nearly unusable. It's not uncommon for Pro Micro's to become "bricked" and unprogrammable. But, in most cases, the bricking is reversible! To revive the Pro Micro, you'll need to find a way to upload a sketch to it with the board option correctly set. We can do this with a little help from the bootloader. First, you'll need to set the serial port to the bootloader. But that port is only visible when the board is in bootloader mode, so pull the reset line low twice quickly to invoke the bootloader reset feature discussed above. On Pro Micro's, or other devices which don't have a reset button, you can either use a wire to quickly short 'RST' to 'GND' twice, or wire up a temporary reset button. While the Pro Micro is in the bootloader change the 'Tools > Serial Port' menu to the bootloader COM port. Quick! You've only got eight seconds. On Windows, the bootloader's COM port number is usually one number higher than the Pro Micro's regular port number. With the serial port set, we're just about ready to re-upload our sketch. But first, double check that the board is correctly set. Then reset to bootloader again, and quickly upload your sketch. Again, you'll have to be quick...you've only got eight seconds. It may help to press the Upload keybind -- CTRL+U / CMD+U -- immediately after resetting. It can take a few tries to get the timing right. Since the code has to compile first, it may help to hit upload first and then reset. We found that an ATmega32U4 (like the Pro Micro 3.3V/8MHz) can brown out when outputting power to a boost converter. While code can run after uploading, a power cycle from the initial current draw to a boost converter is enough to cause the Pro Micro brown out. Thus causing the sketch to not run. This requires the user to toggle the reset button after a power cycle. If you're having technical difficulties with your Pro Micro or Fio v3, see if any of the answers to these FAQs help. If not, please get in touch with our tech support team. What are VID and PIDs? VID is short for 'Vender Identification' and PID is short for 'Part Identification'. In other words, this pair of IDs defines the device. This is how your computer knows what you've plugged in, what drivers to use with it, what COM port is assigned to it, etc. All native USB devices have a VID/PID. 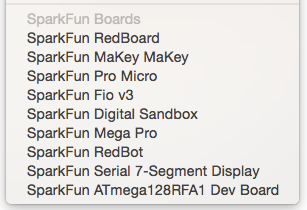 All SparkFun ATmega32U4 boards share the same VID -- 0x1B4F, and they all have unique PIDs. 5V Pro Micros lay claim to PIDs 0x9205 and 0x9206 (one for the bootloader, one for the sketch). 3.3V Pro Micros will show up as 0x9203 and 0x9204 for bootloader and sketch, respectively. And the Fio v3 has 0xF100 and 0xF101. How Can I Change the VID and PID on an ATMega32U4 Board? Every time you upload code the VID and PID are uploaded to the device. These values are located in the 'boards.txt' file and will therefore be determined by the board you have selected. Keep in mind that if you select the wrong board you will get the wrong VID/PID uploaded which means the computer can’t recognize, and program the board. The VID/PID for the bootloader is part of the bootloader file. To change this you will need to recompile the bootloader with the new VID/PID, and upload it. Why Does my ATMega32U4 Board Show up Twice in Device Manager? Both the bootloader and the sketch have their own VID/PIDs. When you plug in a board the bootloader starts running for a few seconds, and you will see the board show up in Device Manager based on those VID/PIDs. After a few seconds, the sketch will start running, and you will see Device Manager disconnect from the bootloader and connect to the sketch. When the IDE resets the board, the COM port is disconnected from the computer. The IDE then looks for a new COM port. This is the port it uses. This is one of those weird things Arduino did to get things to work on this chip. Check out or reinstalling the bootloader tutorial, which should work for both ATMega32U4 and ATMega328 boards. If you have the tools to do so, reinstalling the bootloader is often easier then trying to stay in the bootloader. Since reinstalling the bootloader puts the board back in factory settings this will reset the VID/PID numbers allowing your board to work again.